Cavities are one of the most widespread chronic infectious diseases among children in the U.S. — six in 10 children experience a cavity by age eight. Dr. Koster uses silver diamine fluoride (SDF), a simple, safe, low-cost option to painlessly treat cavities in children who can’t cope with getting traditional fillings. SDF is a sort of ‘fancy fluoride’ that can help stop decay and treat small cavities noninvasively. The SDF remains until a final restoration is completed or the baby tooth falls out. This treatment is best for very young patients with dental anxiety or those who don’t have the physical or mental ability to sit for a restorative procedure. The application of SDF helps stop the decay process from worsening and can be applied every six months while waiting for patient cooperation to improve. It is not considered final treatment and restoration is recommended when a patient is able to tolerate it. Dr. Koster says, “Prevention is our number one priority, but if a child does have a cavity, we need to treat it before the child develops pain and infection. 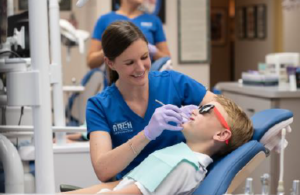 However, we also want to make sure they have a good experience at the dentist, so this is a good way to do both.” She works closely with her Orthodontic colleagues in ARCH’s Stoughton office to provide a comprehensive, comfortable experience for patients and parents. Dr. Koster completed her undergraduate work at Stonehill College and earned her dental degree at Tufts University School of Dental Medicine.